Imagine flying from New York to Tokyo in two hours flat. Imagine a cruise missile travelling faster than a rifle bullet; imagine cheap and efficient space transport. For more than forty years people have been trying to design an aircraft that could deliver such performance. NASA's scramjet-powered X-43A has brought these goals a huge step closer to reality. On 16 November 2004 the unmanned aircraft briefly flew at a staggering 6 800 mph (11 000 km/h), smashing all previous speed records and beginning a new era in aviation development. The X-43A proved that hypersonic flight, at speeds faster than 3 700 mph (6 000 km/h), is possible and that scramjets are workable engines with enormous potential. Although NASA has completed its scramjet tests, the Australians have taken the lead and flew a scramjet in March 2006, just one of three planned. 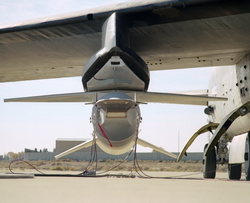 Like the tip of a giant arrow, the 12 ft 2 in (3.7 m) long, wedge-shaped X-43A was attached to the nose of a modified Pegasus booster rocket on 16 November 2004 and slung under the wing of a former B-52B bomber. The massive aircraft carried the pair, called the 'stack', to an altitude of 40 000 ft (12 000 m) over the Naval Air Warfare Centre Weapons Division Sea Range, just northwest of Los Angeles in the United States. Then the stack was released and the Pegasus booster rocket ignited. It accelerated the X-43A until it reached a speed of over Mach 9 (nine times the speed of sound), or a staggering 6 200 mph (10 000 km/h). At an altitude of about 111 000 ft (33.5 km) the unmanned X-43A was let loose and its scramjet ignited. 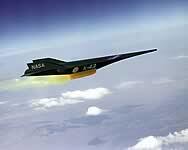 Its engine power was enough to allow it to independently carry on the flight at over Mach 9. The X-43A travelled more than 620 miles (1 000 km) before losing speed and power and plunging into the Pacific Ocean. Throughout the flight completely unique test data was gained. A maximum speed of around Mach 9.6 (around 6 800 mph or 11 000km/h) was attained, smashing the previous speed record of an air-breathing jet of Mach 6.83 set by another X-43A in March 2004. 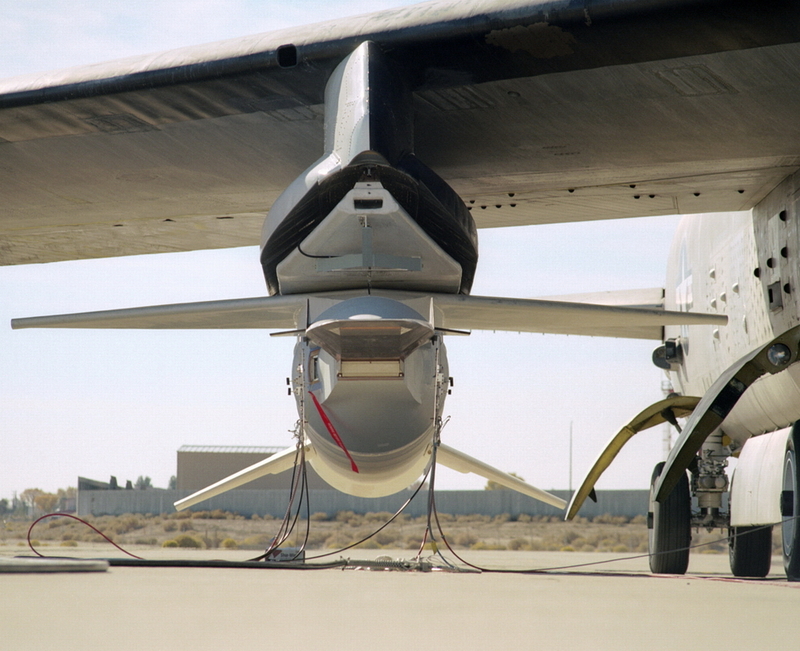 The X-43A's third and last flight under the Hyper-X programme ended in success. NASA's Hyper-X programme was designed to turn scramjets into practical, workable technology and to perhaps use them on future aircraft. The possibilities of scramjet-powered aircraft are enormous, mainly because of their sheer speed. They could one day power long-haul airliners which would dramatically cut journey times - travelling at 9 323 mph (15 000 km/h), an 18-hour trip from New York to Tokyo would become a 2-hour flight. Compared to rockets, they would be cheaper, safer and more flexible and would be able to carry a heavier payload. They would also dramatically improve space travel by cheaply powering reusable orbital space vehicles, allowing more payloads to be sent into space. The greatest advantage of scramjets, (short for Supersonic Combustion Ramjet), is that they can safely, efficiently and cheaply propel aircraft at hypersonic speeds. Rockets tend to produce full thrust or nearly full thrust all the time, while scramjets can be throttled back and flown more like an aeroplane, making them safer. Unlike rockets, they do not need to carry oxidiser (a substance that contains oxygen that allows another propellant to burn) in heavy tanks. Instead, they just scoop up the oxygen they need from the air and compress it as the air rushes through the engine inlet. This allows the aircraft to be lighter, smaller or carry a larger payload than a rocket and be faster at the same time. Conventional jet engines have rotating compressor blades that compress the incoming air before it is sent to the combustion chamber, where it is mixed with fuel and burnt. The hot, expanding gases are expelled through an exhaust pipe to produce thrust. Scramjets, on the other hand, have no moving parts and are thus more mechanically simple. However, designing a workable scramjet has its challenges. The fuel (usually hydrogen) is ignited in a supersonic air stream - equivalent to striking a match in a hurricane. Successful combustion requires careful control of the temperature and pressure within the engine. To make matters even more complicated, the ignition process behaves differently at different speeds. One of the biggest problems with a scramjet is that it needs to be accelerated beyond Mach 4 so that the airflow through the engine remains supersonic. The vehicle must always be moving fast enough to compress the air for the engine. Conventional jet engines, on the other hand, are completely different - they can produce thrust when they are not moving, since fan blades compress the air they use and forward motion is not required. Scramjets can attain hypersonic speeds from about Mach 5/6 up to at least Mach 15. At speeds above Mach 4, the temperature, pressure and volume of air rushing through the engine inlet is enough to allow the scramjet to start running. Getting the scramjet-powered vehicle up to that speed requires either a booster rocket (as in the X-43A's case) or by using turbojet and ramjet engines. The turbojet engine would allow the aircraft to be brought up to the speed a ramjet needs to operate, which is about Mach 3 to Mach 6. (A ramjet is basically the same as a scramjet, but the airflow in the engine is subsonic and thus is only capable of operating at slower speeds.) Once the ramjet has reached its highest speed, which is the scramjet's minimum speed, the scramjet engine can finally start operating. Adding turbojet and ramjet engines to a scramjet vehicle would make it heavier and the design complicated and expensive. Likewise, using a rocket to launch the scramjet would also be expensive, possibly more than adding extra engines. The ideal vehicle would be a completely reusable one, which could take off from a standing start and switch to different propulsion systems as it gained speed. The United States Air Force's (USAF's) Lockheed SR-71 Blackbird reconnaissance aircraft successfully used a turboramjet, which was a combination turbojet/ramjet engine and allowed the Blackbird to cruise at around Mach 3.2. A combined cycle engine is definitely possible. "The next step I would like to see at NASA is to take a turbine engine and a ram-scram-jet, combine those propulsion cycles, put some hardware together and start testing it" said X-43 project manager Joel Sitz. "Maybe in a couple of years we could then put the budget together to put an aeroplane around that technology." If this happened, a truly workable, cheap and fast scramjet vehicle would be able to fly. 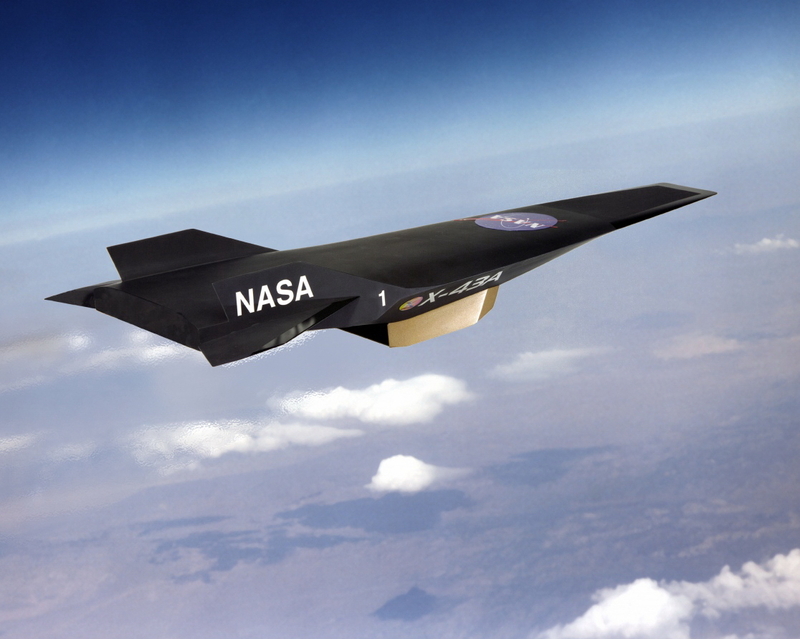 In 1986 NASA began working on its scramjet-powered National Aerospace Plane (NASP), which was designed to be able to reach speeds of more than Mach 15 and be able to take off and land horizontally. However, the NASP programme was cancelled in November 1994 due to cost overruns. NASA then decided to take the technology of air-breathing hypersonic flight to the next level. In 1996 the Hyper-X programme was set up to develop workable scramjet aircraft and practical scramjet technology, and most importantly, to get a scramjet flying. Advances made with the NASP were used in the Hyper-X programme, thus allowing the Hyper-X vehicles to be better, faster and cheaper than the NASP and reducing research costs. Originally, the Hyper-X project was to last just five years and cost $200 million. It was then extended to eight years and has cost roughly $230 million so far, with a total budget increased to $250 million. Conceptual design and wind tunnel work began in 1996 and a contract for three X-43A vehicles was awarded to MicroCraft, Inc (now ATK GASL) of Tullahoma, Tennessee, on 24 March 1997. Ronkonkoma, of New York was also involved in X-43A production. The third main contractor was Boeing Phantom Works of Huntington Beach, California, which designed the thermal protection and onboard systems. Orbital Sciences Corporation's Launch Vehicles Division in Chandler, Arizona constructed the modified Pegasus booster rockets with which the X-43As were launched. The X-43As were all slightly different, since each one was designed to operate at a specific speed. The first two were to function at around Mach 7, while the third one was to fly at Mach 10. At such dissimilar speeds alternative engine inlets and designs were needed to ensure fuel combustion and controlled flight. 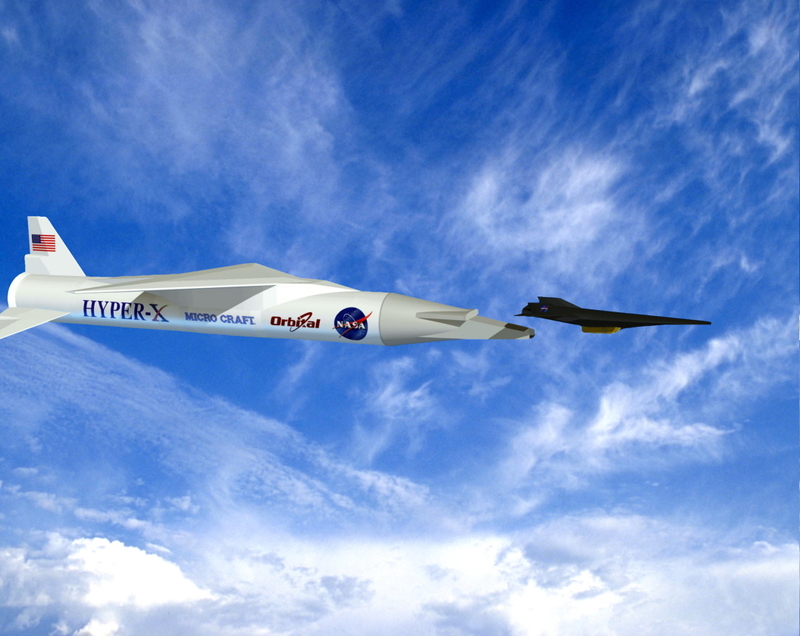 The Hyper-X programme was a joint project effort between the Langley Research Centre in Hampton, Virginia, and the Dryden Flight Research Centre in Edwards, California. It was managed by the Aeronautics Research Directorate in Washington, whose aim is to develop technology transform the aviation industry. Langley was responsible for hypersonic technology development while Dryden was used for hardware integration and testing and flight testing and research. All flights, which used NASA B-52B carrier aircraft, originated from Edwards with testing taking place over the coast of California. A total of three flights were to take place over the Pacific Ocean, with the first two at Mach 7 and the third at Mach 10. The flight schedule would see the X-43A carried to its test altitude of around 100 000 ft (30 000 m). Two small pistons would separate the X-43A from its Pegasus booster rocket and then the vehicle would continue to fly under its own power by using its pre-programmed control system. The engine would operate for around ten seconds, and then go into a six-minute glide. All the time research data would be gained until the X-43A would be safely scuttled into the sea at a pre-selected point. Originally, Hyper-X was to consist of three separate programmes - the X-43A, X-43B and X-43C, and possibly the X-43D. The X-43B was to be a larger version, around 40 feet (12 m) in length and fitted with a reusable combined cycle propulsion system which would have combined rocket and turbine based engine technology, allowing it to fly from low to scramjet speeds without using a separate launching rocket. The X-43C, at 16 feet (4.87 m) in length, was to have been larger than the X-43A. At 5 000 lb (2 270 kg) it would also have been heavier. Equipped with a HyTech solid hydrocarbon fuelled scramjet engine that was under development by Pratt & Whitney, it was to fly at speeds from Mach 5 to Mach 7. The solid fuel propulsion system would have provided a longer test flight time than a gaseous hydrogen engine. The fuel would be used to cool the airframe and engine and at the same time prepare itself for combustion by being melted by airframe heat. Three X-43C flights were planned from 2008 onwards, using modified Pegasus booster rockets. Boeing, Micro Craft, Pratt & Whitney and RJK Technologies were contracted to develop three unmanned X-43Cs, with Boeing being responsible for the design, thermal protection system and flight controls. The X-43C was cancelled in March 2004 after President George W Bush's announcement earlier in January that America would revive manned missions to the Moon by 2015 and would try to reach Mars. Funding and manpower will now go into these programmes and in finding a replacement for the Space Shuttle, which will be based on conventional rocket technology. The other X-43 programmes were also suspended shortly after the X-43C was cancelled. The X-43As were small, unmanned lifting body/wave-riding vehicles only 12 ft 4 in (3.7 metres) long and weighing a mere 2 800 pounds (1 300 kg). Apart from their scramjet engines, the other significant aspect of their design was that they were built to cruise at hypersonic speeds and withstand the extreme friction-generated temperatures that would melt and vaporise most other airframes. They also had to withstand the extreme shock waves that would be generated by the moving air. The wedge-shaped lifting body design was chosen since large wings could not be used - they would create too much drag and might easily burn off. Since they were to operate at different speeds, each X-43A was designed to withstand a specific temperature, but all were equipped with the same tile-based thermal protection system that covered their aluminium airframes. The second X-43A's horizontal tail leading edges reached a temperature of 2 600 degrees Fahrenheit (1 400 degrees Celsius) and its nose 2 000 degrees Fahrenheit (1 090 degrees Celsius) when it travelled at Mach 6.83 in March 2004. Carbon-carbon material was used to withstand the intense heat and prevented the vehicle from burning up. Water was also cycled behind the leading edges of the airframe to keep them cool, a feature which all three X-43As had. Because the third X-43A had to withstand the intense 3 600 degrees Fahrenheit (1 900 degrees Celsius) temperature of Mach 10 flight, it had even more thermal protection. 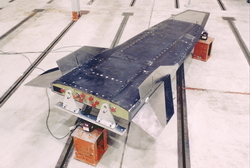 Additional thermal coatings were added to its carbon-carbon horizontal tail leading edges and carbon-carbon was also added to the vertical tails. The tails were also solid, unlike the ribbed tails of the other two vehicles. The X-43A's airframe was innovatively designed to function as part of the engine. The sloping forebody acted as the air intake and compressor. As the air hit the sloping surface, it was compressed as it rushed down into the engine. The rear fuselage sloped upwards and acted as the engine nozzle. Because it is so difficult to ignite fuel in the supersonic air stream inside the engine, a chemical called silane was pumped into the engine. Silane ignites in the presence of air and was essential in lighting the hydrogen fuel supply, which was turned on just after the silane was injected. During each ten second flight, around one kilogram of fuel was used, which is significantly less fuel and oxidiser than a rocket uses. The Orbital Science's Launch Systems Group Pegasus rockets used to launch the X-43As were originally used to launch satellites into low earth orbit - since 1990, Pegasus rockets have launched over 70 satellites into space. To accommodate the X-43As, three rockets were extensively modified, with their second and third stages eliminated, together with the fairings used to protect satellite payloads. Just the first stage solid rocket motor remained. Since the Pegasus rockets had to experience the high heat loads of lower altitude hypersonic flight, they were fitted with additional thermal protection systems. 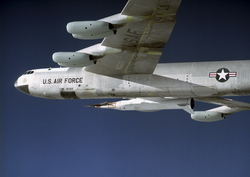 The Boeing B-52B Dryden used to carry and launch the Pegasus rockets is the oldest B-52 still flying. On loan from the US Air Force, NASA has used it for some of the most important aviation projects in history, including launching the three record-setting North American X-15 rocket-powered hypersonic research aircraft in the 1960s. It has also been used to launch wingless lifting body aircraft that contributed to the development of the Space Shuttle. The X-43As had the honour of being the last missions the B-52B undertook before it was retired after nearly 50 years of service. Although three X-43A flights were planned, only two were successful, with the first aircraft crashing into the sea. The initial attempt was on 2 June 2001. At first all went well: the stack was attached to the wing of NASA's B-52B, which took off from Dryden. Once over the Pacific, the Pegasus rocket ignited and successfully separated from the B-52B. Around 12 seconds after separation, disaster struck - the rocket experienced a control problem which led to the rudder controls failing. Moments later the starboard fin was torn from the vehicle, followed by the port fin, then the rudder and wing. This caused the stack to spin out of control and veer off course as it went transonic. NASA ground controllers decided that it would be safest to destroy the two craft, which were blown up at 13:45 Pacific Time, by onboard explosives. Unfortunately, the two craft were destroyed before the X-43A could begin flying independently. A number of factors caused the rocket failure, the main once being the malfunction of the booster's flight control system, which failed because of poor design and insufficient wind tunnel testing. Wind tunnel test data later revealed the need for more powerful booster fin actuators to withstand the higher aerodynamic loads. In addition, changes were made so the rocket could launch at its normal altitude of 40 000 ft (12 200 m) instead of the 23 000 ft (7 000 m) used on the first flight, thus reducing aerodynamic loads even further. The X-43A's second flight went successfully on 27 March 2004. It began at 12:40 pm Pacific Standard Time when the B-52B took off from Dryden with the stack mounted under its wing. Just before 2:00 pm the stack was released and soared up to around 95 000 ft (29 000 m). Once the rocket reached its optimum speed, the X-43A was released and its air intake opened and the engine was ignited before it accelerated away from the rocket. The scramjet burnt for eleven seconds, during which the X-43A travelled at a phenomenal Mach 6.83 and covered 15 miles (24 km). For nearly ten minutes after engine burnout, controllers manoeuvred the X-43A as it glided down towards the Pacific and lost speed. All through the flight unique test data was gained, thus achieving one of the chief aims of the Hyper-X programme: to obtain data that could not be gained in a wind tunnel or on the ground. The X-43A easily broke the record for the fastest free-flying air breathing aircraft in the world. A ramjet-powered missile that flew at a little over Mach 5 in July 2001 held the previous record in the same category. The X-43A's accomplishment was instantly recognised by Guinness World Records, who were going to put it into their next book of records. However, the third X-43A's Mach 10 flight easily broke this record. The idea of the ramjet/scramjet is not a new one, but only now is the technology available to successfully build and fly it. The first idea of a ramjet was formed in 1913 when René Lorin of France recognised the possibility of using ram pressure (pressure generated from forward movement) in a propulsive device. In 1935 the Frenchman René Leduc was issued a patent on a piloted aircraft propelled by a ramjet of his own design. On 21 April 1949 a ramjet-powered Leduc experimental aircraft made its first powered flight. Inspired by Leduc, the French Nord-Aviation company began working on a ramjet aircraft in 1953. Their result was the Griffon II, powered by a hybrid turboramjet engine. On 5 October 1959 it reached a speed of Mach 2,19 (1 448 mph or 2 330 km/h). From the mid 1950s to the late '60s, a number of scramjet engines were built and tested on the ground in the United States and England. In the late 1980s the US launched a $2 billion effort to build the X-30 scramjet powered vehicle capable of orbiting the Earth under the NASP programme. In 1993 it was finally abandoned after the realisation that it would cost $15 billion to complete. The US Defence Advanced Research Projects Agency (DARPA) achieved a milestone in 2001 when the organisation successfully flight-tested a 20 % scale model of a scramjet-powered conceptual missile. Testing was conducted using an enclosed gun barrel facility at Arnold Engineering Development Centre at Arnold Air Force Base in Tennessee. On 26 July the 4 in (10.16 cm) diameter titanium hydrocarbon-fuelled scramjet projectile was launched from the gun at a speed of Mach 7.1 before its scramjet engine fired up and propelled it a distance of 260 ft (72 m) in just over 30 milliseconds. The US Air Force is pushing scramjets for use in hypersonic cruise missiles. Under its HyTech programme, it is developing a scramjet that burns hydrocarbon fuels, which will make it easier to fuel than liquid-hydrogen powered aircraft. The Air Force hopes to demonstrate a working scramjet-powered cruise missile within five years. If, or when, this gets put into production it will be a significant advance in missile technology - the projectile would be able to travel hundreds of kilometres in minutes to attack time-critical targets and would be able to use its extreme speed to penetrate deeply buried or hardened targets. Apart from NASA, the Australians have also been extensively testing and designing scramjets. The first experiments were held in 1981 by the University of Queensland's Centre for Hypersonics in the T3 ground test facility at the Australian National University in Canberra. In 1987 the T4 ground test facility was commissioned at the University of Queensland for studying scramjets. It was the first facility in the world capable of simulating the range of flight speeds required for scramjet development and for measuring the performance characteristics of scramjet engines. In 1993 the T4 facility achieved a breakthrough by achieving the world first of "flying" a scramjet that achieved more thrust than drag. A University of Queensland-led international group attempted to launch a scramjet mounted on a Terrier Orion rocket on 30 October 2001. The ambitious experiment was to be conducted at Woomera in Australia under the HyShot programme, but a flight anomaly caused by rocket fin failure stopped the experimental flight from going ahead. A significant feat was achieved on 16 August 2002 when the University of Queensland completed a successful flight of a scramjet engine under its HyShot programme. Although the vehicle remained attached to its launching missile, it was the first time a scramjet had successfully flown in unrestricted flight. The scramjet engine was attached to a Terrier Orion rocket, which soared up to an altitude of 195 miles (314 km) before re-directing the Orion payload section back down to earth in an effort to gain speed. During the 10-minute flight, the scramjet operated for only a few seconds, but proved that it could work successfully at its peak speed of more than Mach 7. The Australians have collaborated internationally with their hypersonic research. The US, UK, France, Germany, Korea and Japan have all been involved in their programme, which is now the world's largest university-based hypersonics group. The US's involvement has largely been through NASA - the Administration commissioned the University of Queensland group to conduct experiments to aid the NASP programme before it was cancelled. The most recent achievement of the HyShot programme was the successful testing of the HyShot III scramjet engine in late March 2006. The scramjet was launched by a two-stage Terrier-Orion rocket, which took it to an altitude of 195 miles (314 km) before releasing the HyShot III back to Earth, which reached an estimated speed of 5 600 mph (9 000 km/h) or Mach 7.6. The scramjet was designed by the UK's Qinetiq, but the next two test flights later in the year will involve an engine designed by the Japanese Aerospace Exploration Agency (Jaxa) and one designed by the Australian Defence Science and Technology Organisation (DSTO). This scramjet is expected to be launched in June 2006 and reach a top speed of Mach 10. The Australians aim to conduct six scramjet flights over the next five years, which is planned to lead to a free-flying scramjet engine. The HyShot programme hopes to some day use scramjets to cheaply launch small satellites into space by incorporating a scramjet engine into the launching rocket. The first stage of the rocket would propel it to scramjet speed when the scramjet would take over, and then another rocket would propel the satellite high into the atmosphere and into space where there is insufficient air for the scramjet to operate. Scramjet research is rapidly progressing across the world, with the Australians taking the lead. The X-43As have shown that hypersonic flight is certainly possible and that scramjet engines can operate flawlessly. As a result of scramjet development, one day there will probably be scramjet-powered airliners that take passengers from New York to Tokyo or London to Sydney in two hours or even less. It is almost guaranteed that hypersonic cruise missiles will be produced in the near future, as well as scramjet/rocket powered space launchers. It is estimated that the first manned scramjet-powered craft could take to the air around 2025, with mass produced unmanned craft much sooner. Hyper-X project boss Vincent Rausch said that the programme "could mark the beginning of a revolution in aviation and spaceflight". From the amount of progress that has been made, it certainly looks like the scramjet revolution has begun. The X-43A is largely to thank for it, since it was the successful hypersonic pioneer.